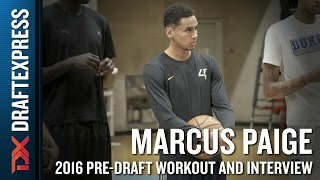 North Carolina's Marcus Paige works out in preparation for the 2016 NBA Draft in New York City. Marcus Paige was nearly the hero of the national championship game with his incredible double clutch shot to tie their game against Villanova with just under five seconds left, but the Tar Heel defense gave up an open jumper to Kris Jenkins and Paige's career ended in heartbreak. Nonetheless, Paige had an excellent four seasons for North Carolina and now hopes to earn a shot in the NBA. Paige is a versatile offensive player, and while he likely projects as a point guard for the majority of his minutes at the next level, he is able to contribute off the ball as well. He is a high IQ player, always seeming to make the right decision and putting himself in position to make winning plays. Paige isn't an exceptional athlete and his measurables are average for a NBA guard, so he will have to prove he is skilled enough to impact the game on a regular basis against more physically gifted players. He was last measured at 6'2, (albeit with a solid 6'6 wingspan) and still possesses a narrow 164 pound frame which hasn't added much weight since our first measurement back in 2011 (156 pounds). Paige is a good creator for his teammates on the ball, sporting a 3.05 assist to turnover ratio. He makes the simple pass out of ball screens or in transition with good vision to see the open man and deliver the ball to them in scoring opportunities. He won't try to force tough passes, turning the ball over only 1.5 times per 40 minutes pace adjusted, fewest among point guards in our top 100. He's not the flashiest passer, but is happy to run his team's offense with his high basketball IQ, will value the ball and usually takes what the defense gives him. Paige was not a prolific or highly efficient shot-creator inside the arc for most of his college career, sporting just a 45% 2-point percentage in his four years, while getting to the free throw line at a very low rate (2.9 attempts per-40). He's not a guy who will simply blow past his defender or break his man down off the dribble to get to the rim on a regular basis. When he does get to the rim, he isn't a great finisher converting at a below average rate of 44.9% according to Synergy Sports Technology. He tends to shies away from contact, shooting only 3.4 free throw attempts per 40 minutes pace adjusted as a senior. He struggles with his floater outside the restricted area as well, only going to it as a last resort and not demonstrating the required touch for it to be a weapon against rim protectors. While he doesn't project to be a reliable paint finisher at the next level, he is a capable shooter off the bounce at 45.1% on 51 attempts according to Synergy Sports Technology. He can attack from the three point line into the paint and pull-up off one or two dribbles going to his right or left. Being able to hit these mid-range shots consistently will be key for him as they will be a big part of his offensive repertoire without the ability to be a prolific finisher closer to the rim. Paige had a rough shooting year on catch and shoot opportunities and the ability to knock these shots down off the ball will help his offensive profile. After shooting a combined 39.2% on threes his sophomore and junior season, that accuracy shrunk to 35.6% overall and 31.9% on catch and shoot chances categorized by Synergy Sports Technology. He isn't just a standstill spot-up player as he has shown the ability to come off screens, dribble handoffs or relocate off a cut for a jumper, so there is plenty of hope that his spot-up jumper will bounce back with better spacing in the NBA. While he won't be the focal point of an offense, he can provide the defense with different looks from time to time. Defensively, Paige's overall physical profile suggests he may have some struggles adjusting to guarding bigger and stronger players in the NBA initially. He isn't blazing quick laterally and can get pushed around at times going up against bigger guards, or when trying to fight through screens. He did improve this part of his game as his college career moved on, though, putting better effort in and showing some peskiness staying in front of opponents and getting in the passing lanes using his length. Still, he'll have to work hard to develop into a solid defender at the NBA level, so sustaining a high effort level and improving his fundamentals to play well within a team concept will be key. Paige's offensive versatility as a shooter and playmaker makes him an intriguing prospect, but he has to prove to NBA scouts that his average physical tools won't be a hindrance when going up against higher level competition, particularly on the defensive end. He does have the skill-set, mental toughness and feel for the game that should give him plenty of chances to prove he can be a rotation player as combo guard coming off the bench. Marcus Paige wrapped up a solid and steady week at the NBA Combine with a strong outing in his final game, putting the ball in the basket prolifically, while playing mistake free-basketball and competing nicely on defense. He showed little issue translating his perimeter shot out to the NBA line, even seemingly enjoying the added spacing that comes with the much further line, hitting 5/9 attempts in two days, some of which came off the dribble out of the pick and roll. Paige is not the most impressive prospect from a physical standpoint, possessing just an average frame (164 pounds) and ordinary explosiveness, but he really makes the most of what he has with his ability to operate at different speeds, while using crafty footwork and off-hand floaters with soft touch. He only got to the free throw line once in two games, though, which is not out of line with what we saw from him over the course of his UNC career. While Paige doesn't have great size at just 6'0 ½ without shoes, he did measure a 6'6 wingspan, which is above average from an NBA standpoint at his position. He's turned himself into a more than adequate defender over time, thanks to his quick hands, strong feel for the game, and excellent competitiveness level. He had a number of impressive possessions at the Combine on that end of the floor, which is really important considering how much of a factor that will play in his ability to carve out a role at the NBA level. Paige has added only put eight pounds of weight onto his slender frame in the last five years according to our measurements database, which raises some concerns about his ability to hold his own physically against bigger and stronger guards at the NBA level. While he may not blow you away with his upside, his strong blend of scoring and playmaking, particularly in terms of his shooting range and knowledge of the pick and roll, combined with his excellent intangibles, give him a good case to be made as a NBA backup. As is often the case with players in his mold, Paige will need to have some things break his way to earn a roster spot and keep it, and that may involve some time in the D-League, where he'll be highly coveted next season. There are a number of players with similar profiles currently seeing minutes as backups in the NBA today, though, so it shouldn't surprise anyone if he ends up carving out a niche for himself. On the surface, it seems like Marcus Paige took a step back in his junior season, seeing his point production decrease by three points per 40 minutes pace adjusted while also seeing a two point drop in his true shooting percentage to 57%. However, he was hampered by injuries all season, including plantar fasciitis in his right foot, and a right ankle injury that required surgery after the season. Paige returns to Chapel Hill for his senior season, hoping to lead North Carolina back to the Final Four, while also cementing his name in the NBA Draft conversation. Primarily a point guard throughout his collegiate career, Paige has begun to play more off the ball over the past season, as he was UNC's only reliable perimeter shooter, so it's worth monitoring his usage this season. Although he doesn't always bring the ball up the court, much of the offense runs through him and he is charged with creating plays for the offense. He can also play off the ball by spotting up on the wing, running off screens or moving to get a step on his man to lead into a pick and roll. As a point guard, he has excellent vision and can make every pass necessary to an open teammate. He has the court awareness to drive and kick or make wraparound passes, behind the head passes, and cross-court passes on target to his open teammates. His pure point rating of 3.10 is fourth among point guards in our top 100 and he has done a nice job of cutting down on his turnovers, from 3.1 per 40 minutes pace adjusted his freshman year to just 2.2 last season. His decision making has improved and he doesn't try to do too much on offense any more, playing within his limits. This also showed up in his shot selection, highlighted by his 57% true shooting percentage. He's an excellent three point shooter, with such attempts accounting for 57% of his field goal attempts, where he converted 39.5% of his attempts. He is a deadly catch and shoot player and is comfortable ball faking and taking one dribble step sideways before launching his jump shot to beat the closeout. He's turned many of his long two's from prior years into threes that way, which NBA teams will enjoy. He can attack a closeout by dribbling into the paint, but seems more likely to try to find an open teammate rather than his own shot. He already has a nice touch on his floater, which he will need as he doesn't have the size, explosiveness or body frame to absorb contact around the rim. He isn't a great finisher at the basket and he doesn't attempt many free throws (3.3 per-40) despite converting on 86.5% of his attempts. His 6'2, 175 pound frame isn't built to withstand constant contact from NBA big men, but he already shows different ways to beat the defense when he gets into the paint. NBA teams may question his athleticism and whether his skills will be translatable against the athletic NBA point guards. He's undersized by all measures and none of his athletic tools leap off the page. His frame is especially concerning, considering he is already 22 and he'll have to answer whether he can add enough strength to withstand the rigors of a NBA season. His overall speed and explosiveness are also below average, which may cause him to struggle off the dribble and finishing at the rim. He already struggles to turn the corner which forces the offense into tough jump shots or a full reset on the play. His 44% 2P% ranks very poorly compared to other prospects, and he doesn't compensate for that by getting to the line at a high rate. Paige's average tools will also hurt him on the other end of the floor, and it's difficult to project him as an above average defensive player. He's already at a disadvantage due to his lack of size and smaller frame and his poor length doesn't help. He is susceptible to getting beat off the dribble by smaller, quicker guards and can be outmatched physically by bigger guards. He'll have to do his best to fully grasp the concepts of a NBA defense, funneling his opponent to his teammates and make the right rotations to slow down the offense. To his credit, he is highly intelligent and competitive, and shows good instincts off the ball, averaging nearly two steals per-40 minutes. Paige's flexibility to be either molded into a point guard or play as a scoring guard makes him an attractive draft prospect for NBA teams. He'll have to answer questions as to how he will hold his own against NBA players athletically on a nightly basis, but he has enough skills, savvy and smarts that should get him a chance to prove whether he can do so. One of the few committed players in attendance at the 2011 Boost Mobile Elite 24, Marcus Paige (#29 Scout, #28 ESPN, #41 Rivals) showed a smooth, well-rounded offensive game and a tremendous basketball IQ that didn't account for many highlights, but offered an impressive glimpse of things to come for the young point guard. From a physical standpoint, Paige doesn't stand out among the other guards in this class at first glance. Showing an underdeveloped frame at this stage, the Iowa native had a difficult time dealing with the size and strength of the NBA players he matched up with during the late night scrimmage. What Paige does have, is a degree of sneakiness to his athleticism that complements the rest of his game. The UNC commit may not rise up often to dunk on opponents on his forays through the paint, but he has a quick first step, sets up his drives well with fakes, knows when to push the ball in transition, and has the ability to change gears to create separation. He is very crafty with the ball in his hands on the offensive end, showing the ability to create for himself and others off the bounce. A traditional point guard who shows good vision and decision-making, Paige has the demeanor and skill set to become a fine distributor. On top of his passing ability, Paige is also a competent scorer. He has a smooth left-handed jump shot that he can knock down with range off the catch and off of one or two dribbles from the midrange. A fundamentally sound offensive player, he doesn't force the issue very often, balancing his scoring and passing responsibilities and understanding that his lack of strength is a limiting factor when he tries to finish at the rim. On the defensive end, Paige does a good job getting in the passing lanes and forcing turnovers. He isn't the biggest or longest player around, but shows consistent intensity and made himself surprisingly pesky matching up with his peers. He'll need to gain weight to consistently defend stronger guards at the next level, but there's no question that he has the basketball IQ and mentality needed to defend within a team concept. One of the more polished guards we saw at the Boost Mobile Elite 24, Paige's physical profile will be an x-factor for his prospects long-term. He has the skill set, intangibles, and intelligence to flourish as the leader of UNC's fast break, but his ability to match-up physically with point guards at the NCAA level is something to keep an eye on.